On 14th July, 1863, George B. Fowler of Chicago, Illinois, was granted his first patent (US39222) for an adding machine. In 1890 Fowler received a second patent (US432266) for improved version of his device. George B. Fowler was born in Long Island in 1834. In early 1860s he was a resident of Chicago, Illinois. By 1864 he had settled in New York City, opening a company to produce his adding device. In late 1860s he was a patent agent in Brooklyn. 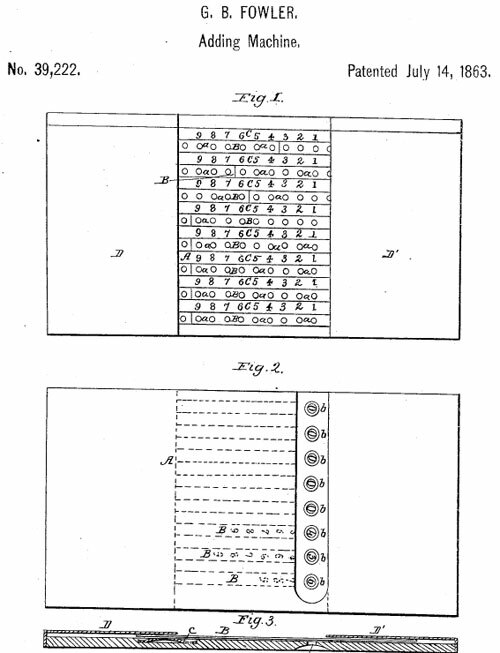 Besides the above-mentioned patents for adders, Fowler went on to patent a variety of other devices, including a clothes and hat hook (US40923), a crusher and press (US136498), wood-splitters (US53289), a game-box for ten-pins (US107030), a wagon-jack (US113285), an eggbeater and mixer (US256310), a picture cord and hook hanger (US357312), a cane and cigar case (US368823), a hand grip tester (US344095), a clam roaster (US424875), etc. In 1860s the machine was advertised as the only practical and reliable adding machine in the world :-), and was reported to be on market since 1869, produced by the company of its inventor—Geo. B. Fowler & Co., Chicago, IL (see the upper photo). Fowler garnered testimonials from lumber dealers, bookkeepers, and insurance companies, and hoped to find agents who would pay substantial sums to market his machine, but there is no indication that this occurred. Later on Fowler moved to New York and founded a new company—Fowler Adding Machine Co., New York, which produced the device. When launched to the market, the device cost $5. In 1890s the device was sold for $8 by the Universal Adding Machine Co., under the name Universal Adding Machine. The machine (see the lower drawing from the first patent) was a slide bar adder, operated by pin or pencil. It was a wood and metal device, with measurements: 1 cm x 22.5 cm x 11.5 cm. The upper slide represents the units, the next the tens, etc. If it is desired to add two numbers, for instance 251 and 185, the pin is inserted into the hole opposite the figure 1 on the first slide, and said slide is pushed toward the right until the pin strikes the cap D'. Then the pin is inserted into the hole opposite the figure 5 on the second slide, and so on for all digits of the addends. If the hole is on the dark portion of the slide, then the said slide has to be moved leftward, instead of rightward. The result of operation is ascertained by turning the platform A upside down and noticing the figures appearing on the under side of the slides opposite to the apertures b (see the lower image) in the platform.